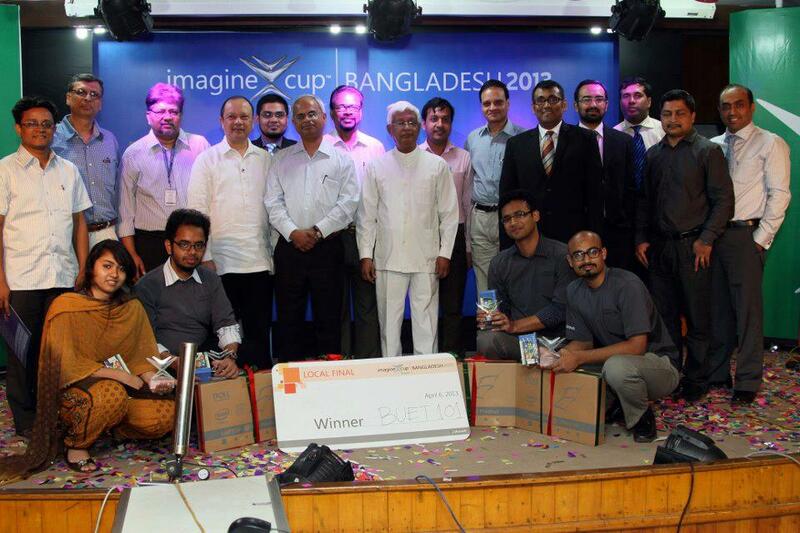 BUET team consisting of 4 students from the Department of CSE and EEE has won the Microsoft Imagine Cup 2013 Bangladesh Round Grand Finale, arranged in AIUB on 6th April. They may represent Bangladesh in the world finals arranged in Russia this year. 135 teams from different universities all over the Bangladesh have participated in the preliminary round of this contest. 12 teams have been selected from here to make their presentations before the judges. From here four team have got the opportunity to present their projects in the Grand Finale. Distinguished judges from the Governmental agencies and industry have examined the projects and gave their opinion and declared the team BUET 101 as the champion of the contest. We hope the winning journey of BUET 101 continues in the world finals if it gets sponsorship. We congratulate the team members Bashima Islam (‘10 CSE), Tamzeed Islam (’10 CSE), Zaheen Mustakin Ayon (’10 EEE), Morshedul Haque (’10 EEE) and their mentor Assistant Professor Hasan Shahid Ferdous on this achievement. Special thanks to Associate Professor Dr. Mohammed Eunus Ali, Sajjadur Rahman and all our students who have been a constant source of inspiration for the team and provided their warm support.